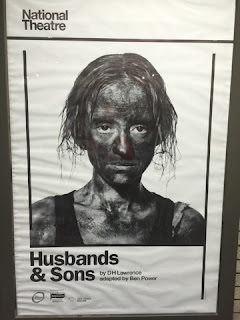 Last night Stuart and I went to see Husbands and Sons at the Dorfman Theatre on London's glitzy South Bank. Husbands and Sons interweaves three of D H Lawrence’s greatest dramas - The Daughter-in-Law (1912), The Widowing of Mrs Holroyd (1914) and Touch and Go (1920) - and plays them all simultaneously. Three plays in one. The acting was superb (especially Anne-Marie Duff) but the stories were utterly depressing though. All the husbands were brutes, the son's wimps and the mothers overbearing. The women struggled to make ends meet while their drunken husbands blew what little they earned down the pub. The set was a giant lift on top of a dusty, dirty coal pit with the three dramas playing out in three households precariously floating on top. The props were sparse so the actors ended up not only mining but miming too. Describing the world he came from with fierce tenderness, Lawrence evokes a now-vanished world of manual labour and working class pride. The language is full on Yorkshire. Despite the masculine title, the plays look to understand the experience of wives and daughters as much as they do the husbands and sons. It is the women of the village, wives and mothers, who struggle to hold their families and their own souls together in the shadow of the great Brinsley pit. An interesting quirk of the production was that we all swapped seats at the interval. It gave us all a different physical perspective on the play. But our view of the material was unchanged. It's grim up North.